One of the factors motivating Team Expansion to begin recruiting teams to plant churches in Italy was a request by resident, veteran missionaries knowing that they were getting older and that new teams and younger recruits were needed. 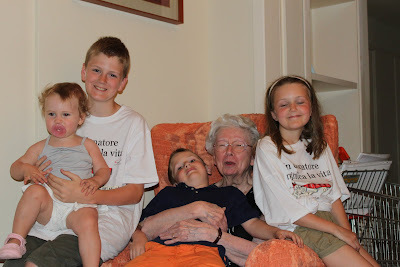 warmly encouraged us and challenged us that day as we prepared to leave for Italy. Before leaving his home he handed me a worn and intricately decorated, leather-bound Italian Bible which I still have. Charles passed away in 2001 here in Italy while back visiting. Another of the veterans was Jessie Lee Troyer who just passed away this week. We had the chance this last June to stop in and visit with Jessie Lee in her apartment in Bari (see picture at right) on our way home from a national gathering of Christian Church brothers and sisters. Always hospitable and sharp of mind to the very end, she was another one of the pillars that saw the current movement of Restoration churches off and running. She sent us off that day, the kids' tummies full of ice-cream, and our car crammed with a heavy box full of kid's Bible lessons. 1. Thank you to all those who have gone before us, selflessly giving of themselves, pouring themselves into relationships, discipling, preaching, organizing, translating, publishing, editing, encouraging, disciplining, praying, leading and serving. We wouldn't be where we are today without you. 2. Lord, please strengthen those who continue on. Protect them, guide them and open up doors for Kingdom growth. Please take the seeds they have planted and watered and bring the Harvest. Please send more workers to the field. Raise up men and women to go and raise up churches to send and sustain them. A little over a year ago I began volunteering at the local Catholic mensa which is essentially a soup kitchen for the poor and homeless only instead of soup, they serve a two-course Italian feast of donated-because-they-are-nearly-expired-but-still-delicious-food. I began volunteering, having been convicted of not walking the talk, and I have learned. So. Much. rest of his outfit. Mary’s mood varies, but he often seems impatient, like he has somewhere else to be. For a little over a year, I see Mary every Tuesday. He shows up and sits quietly in the front office and waits. Suor Francesca, one of the nuns that runs the kitchen, told me that he doesn’t eat upstairs with the rest of the ospiti because they make fun of him. So without fail they pack him a lunch to go in little, white containers, tucked in a little, white bag with a hunk of bread nestled on a neat, white napkin. He always thanks me when I hand it to him. I smile, which he returns and proceeds to walk off in boots or high heels. The biggest lesson I’ve learned from the nuns and volunteers at the mensa doesn’t have to do with their delicious recipes or their incredible organizational skills, it isn’t even kindness, for at times they have to be downright mean and loud and direct to get things done. It is grace. It is the living out of Jesus’ words to throw open the doors to everyone. It is the ability to set down a plate of piping hot pasta in front of the Tunisian Muslim just as easily as before the Italian Catholic or the Pakistani Hindu. None of the volunteers criticize Mary. No one makes him feel bad. They don’t judge him. They ask him to share his story. They give him concrete, tangible expressions of love and acceptance. They protect him. They allow him to simply belong as they give him hope and help him succeed at living. Mary died last month. The headlines announced in very black-and-white terms that Ancona’s first trans-sexual died on the street, trying to catch a bus to the hospital. Just like that, one of the city’s most unique personalities, what most would consider an eyesore or an embarrassment, is gone and he leaves a void behind in a culture where centuries of tradition are clashing with post-modern ideas about gender roles and sexuality. And now Tuesdays come and go, almost the same: a sea of faces coming in from the cold for a warm meal; names in a dozen languages, many I can’t even pronounce. Mary’s void simply and yet loudly takes the shape of an empty chair and it reminds me to accept people as they are, to look them in the eyes and see their worth and their need and love them like Jesus did. Only He can give them life and yet we are the vessels he works through. Thanks Mary for helping me see things a little more clearly.